Taco Bell has a long history of fairly fun, interesting ads. Some are funny, because they’ve engineered them to be funny. Some are funny because, well, c’mon – Drive-Thru Diet? Christine, imagined as a hipper counterpart to equally unimaginative fast food dieter Jared Fogle of Subway, somehow found a way to eat taco bell food and lose weight. What’s that, you say? 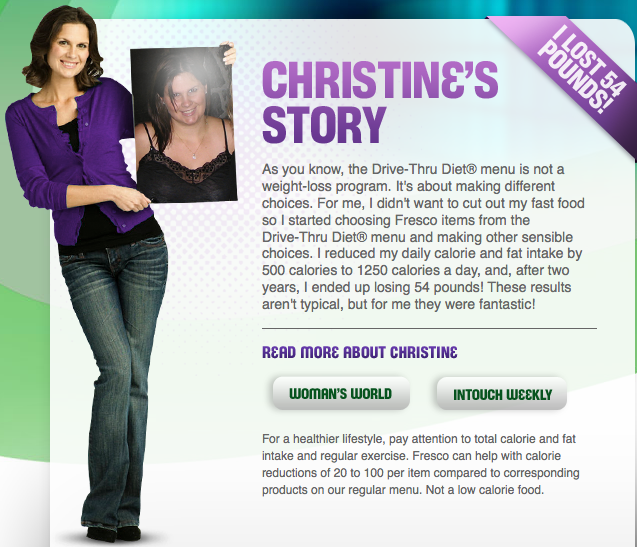 Visit the informative Drive-Thru Diet website for more info! Sure Christine! How soon can I click? Ah, the details. She lost half a pound per week for two years by eating only 1250 calories per day, down from her previous apparent gluttony of eating 1750 per day. But she didn’t have to give up that yummy fast food! What else Christine? What else? I am totally on board now. I can make a FRESCOLUTION! That’s a Fres-Co-Lution, or FRe-SCol-Ution – no – FRESCO-lution. Maybe they’ll tell me how to pronounce it when they start sending me my “e-couragement” cards! But I find my eyes wandering. What’s that up there beside the Drive-Thru Diet? OK, I’m thinking outside the bun. What, pray tell, could FOURTHMEAL be? It’s right there beside the Diet, but eating a fourth meal doesn’t seem to be consistent with the idea of a diet. Let’s click on over. Aha! FOURTHMEAL is the meal between dinner and breakfast. Surprisingly, no Drive-Thru Diet items are available at FOURTHMEAL. Because, of course, if you’re on the Drive-Thru Diet, you’ll have already consumed your daily ration of calories by the time you’re having SECONDMEAL. 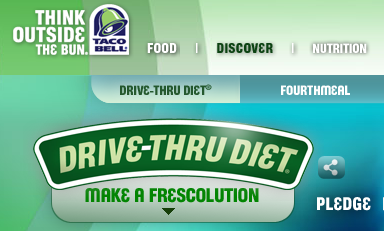 The Drive-Thru Diet campaign could not be more cynical. Taco Bell food cannot reasonably be considered a part of any healthy eating plan. Sure, if you ingest two ounces of neon volcano nacho cheese daily, forsaking all other foods, you’ll soon lose weight. And friends. You’d need some severely delusional rationalization skills to believe you’re likely to lose weight while making a run (for you, fatty, that’s drive) to the border. Taco Bell’s FOURTHMEAL campaign is, by contrast, the most sincere pitch they can muster. When you have no other options, because sane places are closed, here is something to eat. Oh, and you can also buy it for lunch and dinner, but we won’t pretend it’s healthy.